The mystery of who bought the Las Vegas Review-Journal seems to have been solved. The evidence turned up by the Sin City paper itself, Fortune and others is pointing to Sheldon Adelson, who controls casino operator Las Vegas Sands. But why he snapped up Nevada’s top paper remains unclear. Acquiring the South China Morning Post might have made more business sense. Adelson tried to keep his $140 million purchase secret by using a Delaware-based shell company. When asked whether he was the buyer, the casino mogul said he had “no personal interest” in the newspaper. For now at least, the Review-Journal employs investigative journalists, so it’s no surprise that Adelson was outed. But why own a publication with a declining circulation of around 170,000? Adelson, who got his start selling newspapers on a Boston street corner, is already a big deal in the Silver State, and worth some $24 billion according to Forbes. He’s a huge Republican donor and Nevada is an important swing state. Yet the Review-Journal is already on Adelson’s side, having endorsed GOP candidate Mitt Romney in the 2012 presidential election. More to the point, Vegas represents just a sliver of Adelson’s gambling empire. The $35 billion Las Vegas Sands reported adjusted EBITDA of $208 million from its Sin City properties in the first nine months of 2015. Sands casinos in the former Portuguese colony of Macau, now administered by China, generated $1.6 billion of EBITDA – eight times as much, even after a 36 percent drop from the same period in 2014. The U.S. company’s 70 percent stake in the Hong Kong–listed parent of the Macau casinos accounts for more than half of its market capitalization. And the Macau operations need the most help. The junkets of Chinese businessmen and communist party officials that kept casinos humming have ground to a near halt thanks largely to President Xi Jinping’s corruption crackdown. Casino gaming revenue in Macau is running 35 percent lower this year than last, and the territory’s GDP has shrunk by a quarter. Macau’s secretary for economy recently met with casino operators to gauge their views on the crisis. Ideas like smoking bans and diktats to create more family-friendly entertainment were on the table. For Adelson, the bully pulpit of a prominent newspaper in Hong Kong, close to the gaming pits of Macau, might do more for business than one in Vegas. But Alibaba, the e-commerce group founded by Jack Ma, just snapped up the SCMP. Chairman and CEO of the Las Vegas Sands Corporation Sheldon Adelson looks out at the audience at the National Israeli-American Conference in Washington October 19, 2015. The newspaper, Nevada’s largest, has long been regarded as possessing outsized political influence in a swing state. 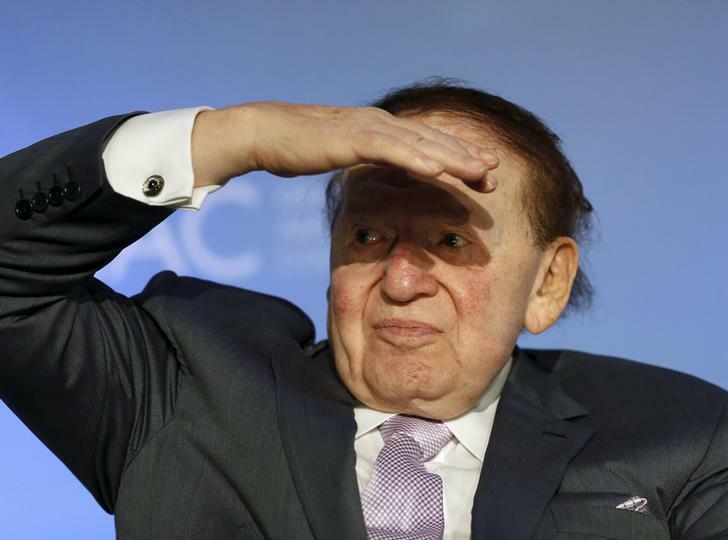 Adelson is widely expected to be the top Republican donor in the 2016 election. Most of the Republican candidates have assiduously courted his approval, traveling to Las Vegas to meet with the 81-year-old gambling magnate, who Forbes magazine says is the 15th richest man in America. Adelson is known for his ardent support of Israel and his desire to ban online gaming. Alibaba, the Chinese e-commerce group founded by Jack Ma, said on Dec. 11 it will acquire the South China Morning Post and related magazines, conferences and other assets. Financial terms were not disclosed.